Don’t miss the chance to win a Medium Trauma Bag and Survival Medicine handbook ($256 value! ), see below for details! 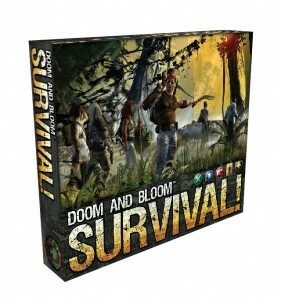 Our kickstarter project to manufacture our new board game, DOOM AND BLOOM’s SURVIVAL!, is now up and running! What’s that? Ol’ Dr. Bones and Nurse Amy playing board games? Yes, it’s true, we’re longtime board game fans, and we wanted to figure out a way to get older kids and others in your family that aren’t in the survival mindset to get involved. So why not a fun and challenging family friendly board game that’s all about scavenging resources, scouting locations, and putting together a group of survivors? So what’s the deal? Doom and Bloom™’s Survival! is a board game for 2-4 players. It takes place in a post-pandemic world where there are few survivors, one of which is you. Your mission is to have your character accumulate supplies like food, fuel, weapons, and medical kits, as well as scout locations that may serve as a haven in which to start over. 14 Comments on "The Doom and Bloom SURVIVAL! board game"
They hit on a great idea with the board game. We all know that learning made to be fun sticks around a lot longer than rote memorization. This is a great prize! Thanks for giving us a chance too win. I hope im doing this right. What a fun way to learn! Good job! This is going on my wish list. The gear shown at the Mesquite Prepper seminar was GREAT ! I am so excited; this will be fun and educational…what more can you ask for? I would like to purchase the kit and book. Is that possible. If so let me know when that will be. What a great idea! Combining family fun with preparedness.